Stylish, contemporary and a short drive from iconic Hastings Street, RACV Noosa Resort offers smart accommodation overlooking a pristine wetlands sanctuary. Located close enough to explore Noosa's award-winning restaurants, chic cafes and bars, farmer's market and miles of pristine beach, yet far enough away to enjoy the serenity of the resort's secluded location, the property is ideal for business and leisure travellers. Offering suites and apartments with either private courtyards, balconies or rooftop terraces overlooking the resort or across the lush sanctuary to Noosa Sound. 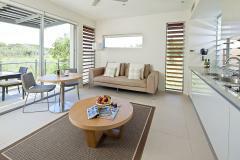 The RACV Noosa Resort is positioned on a 15-acre site beside the Weyba Creek, a tributary of the Noosa River. Wake to the sound of whipbirds or fall to sleep to the friendly call of the resident geckos.